Rahul: Eric, can you tell us what The Van Gogh Blues is about? Eric: For more than 25 years I've been looking at the realities of the creative life and the make-up of the creative person in books like Fearless Creating, Creativity for Life, Coaching the Artist Within, and lots of others. A certain theme or idea began to emerge: that creative people are people who stand in relation to life in a certain way—they see themselves as active meaning-makers rather than as passive folks with no stake in the world and no inner potential to realize. This orientation makes meaning a certain kind of problem for them—if, in their own estimation, they aren't making sufficient meaning, they get down. I began to see that this "simple" dynamic helped explain why so many creative people—I would say all of us at one time or another time—get the blues. To say this more crisply, it seemed to me that the depression that we see in creative people was best conceptualized as existential depression, rather than as biological, psychological, or social depression. This meant that the treatment had to be existential in nature. You could medicate a depressed artist but you probably weren’t really getting at what was bothering him, namely that the meaning had leaked out of his life and that, as a result, he was just going through the motions, paralyzed by his meaning crisis. Rahul: Are you saying that whenever a creative person is depressed, we are looking at existential depression? Or might that person be depressed in "some other way"? Eric: When you're depressed, especially if you are severely depressed, if the depression won't go away, or if it comes back regularly, you owe it to yourself to get a medical work-up, because the cause might be biological and antidepressants might prove valuable. You also owe it to yourself to do some psychological work (hopefully with a sensible, talented, and effective therapist), as there may be psychological issues at play. But you ALSO owe it to yourself to explore whether the depression might be existential in nature and to see if your "treatment plan" should revolve around some key existential actions like reaffirming that your efforts matter and reinvesting meaning in your art and your life. Rahul: So you're saying that a person who decides, for whatever reason, that she is going to be a "meaning maker," is more likely to get depressed by virtue of that very decision. In addition to telling herself that she matters and that her creative work matters, what else should she do to "keep meaning afloat" in her life? What else helps? Eric: I think it is a great help just to have a "vocabulary of meaning" and to have language to use so that you know what is going on in your life. If you can't accurately name a thing, it is very hard to think about that thing. That's why I present a whole vocabulary of meaning in The Van Gogh Blues and introduce ideas and phrases like "meaning effort," "meaning drain," "meaning container," and many others. When we get a rejection letter, we want to be able to say, "Oh, this is a meaning threat to my life as a novelist" and instantly reinvest meaning in our decision to write novels, because if we don’t think that way and speak that way, it is terribly easy to let that rejection letter precipitate a meaning crisis and get us seriously blue. By reminding ourselves that is our job not only to make meaning but also to maintain meaning when it is threatened, we get in the habit of remembering that we and we alone are in charge of keeping meaning afloat—no one else will do that for us. Having a vocabulary of meaning available to talk about these matters is a crucial part of the process. 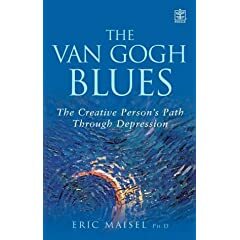 Rahul: Your book talks about creativity, meaning/ purpose, and depression. You also talk about success, which according to you is not a measure but a feeling. Is depression a frequent corollary of losing? Eric: Our disappointments, regrets, feelings of failure, and experiences of not succeeding (or of not succeeding enough) can all breed depression. We can go for long periods of time without any outward success, living on hope and calling ourselves successful by virtue of the fact that we are continuing to try. But at some point (often in a person's mid-thirties) we find it hard, if not impossible, to continue without real-world rewards and recognition. This is why we must redouble our marketplace efforts rather than give in to our feelings that we are "no good" at self-promoting or "above" self-promoting; if we don't redouble our efforts and accrue some external successes, we risk losing all motivation to proceed. Rahul: You say that purpose wins if we do not experience success. What do you tend to imply here? Eric: The fact that we are making an effort counts for a lot: we can stay buoyed by reminding ourselves that we are not attached to outcomes but rather are making ourselves proud by honorably making and maintaining meaning. If we maintain our life purpose, we are entitled to feel proud; in this sense purpose trumps success. However, as I indicated in my last answer, it is very hard, verging on impossible, to keep this good feeling afloat over time without sufficient real-world successes; without that success, we may have to find some other way to make meaning and some new places to make meaning investments. Rahul: What is more important in life - creativity or objectivity? Eric: The dream is nothing without reality and reality is nothing without the dream. We want to dream large, which includes nurturing our deepest creativity, and at the same time we want to reality-test well, figuring out how to negotiate the marketplace and also how to negotiate the creative process, which requires our objectivity and real attention as we deal with blocks, resistance, and the other real challenges and pitfalls of process. One doesn’t trump the other—the must go hand-in-hand. Rahul: Is being successful the end of the road for creativity? Eric: There are many pressures on creativity that success brings, among them the pressure to repeat yourself (and your past successes), the pressure to give people what they want and expect, the pressure to accept lucrative offers that do not hold a lot of meaning for you, and so on. But success is not the end of creativity if you remain your own person and stay mindful that success is a blessing and not an albatross and something that you can negotiate if you pay attention to its pitfalls, blandishments, and pressures. Rahul: This is the paperback version of The Van Gogh Blues, How was the hardback version received? Eric: Very well! The reviewer for the Midwest Book Review called The Van Gogh Blues "a mind-blowingly wonderful book." The reviewer for Library Journal wrote, "Maisel persuasively argues that creative individuals measure their happiness and success by how much meaning they create in their work." I've received countless emails from artists all over the world thanking me for identifying their "brand" of depression and for providing them with a clear and complete program for dealing with that depression. I hope that the paperback version will reach even more creative folks—and the people who care about them. Rahul: How does The Van Gogh Blues tie in with other books that you've written? Eric: I'm interested in everything that makes a creative person creative and I'm also interested in every challenge that we creative people face. I believe that we have special anxiety issues and I spelled those out in Fearless Creating. I believe that we have a special relationship to addiction (and addictive tendencies) and with Dr. Susan Raeburn, an addiction professional, I've just finished a book called Creative Recovery, which spells out the first complete recovery program for creative people. That'll appear from Shambhala late in 2008. I'm fascinated by our special relationship to obsessions and compulsions and am currently working on a book about that. Everything that we are and do interests me—that's my "meaning agenda"! Rahul: What might a person interested in these issues do to keep abreast of your work? Eric: They might subscribe to my two podcast shows, The Joy of Living Creatively and Your Purpose-Centered Life, both on the Personal Life Media Network. You can find a show list for The Joy of Living Creatively here and one for Your Purpose-Centered Life here. They might also follow this tour, since each host on the tour will be asking his or her own special questions. Here is the complete tour schedule. If they are writers, they might be interested in my new book, A Writer's Space, which appears this spring and in which I look at many existential issues in the lives of writers. They might also want to subscribe to my free newsletter, in which I preview a lot of the material that ends up in my books (and also keep folks abreast of my workshops and trainings). But of the course the most important thing is that they get their hands on The Van Gogh Blues!—since it is really likely to help them. The spirited exchange in the middle of your interview with Eric on succes and objectivity is an invaluable addition to our on-going dialogue. I feel that you, as technical writer, and your cultural perspective, were the perfect person to tease out these particular refinements and clarifications. Thanks for asking Eric these questions. Good interview Rahul! Glad for the reminder, as Eric pointed out that "success is not the end of creativity if you remain your own person and stay mindful that success is a blessing and not an albatross and something that you can negotiate if you pay attention to its pitfalls, blandishments, and pressures." I find that a good attitude is key in every undertaking. Remember, Rahul, when you're dealing with any large group of humans, such as creative people..... some of them will be awful, a tiny few will be amazingly grand, and most - will be most. A great interview Rahul, the question of creativity and depression for sure is intriguing one. Thanks for sharing this.